ESPN writer Vaughn McClure has reported Atlanta Falcons coach Dan Quinn has ruled out defensive linemen Vic Beasley and Courtney Upshaw for their Week 3 game against the Detroit Lions. Beasley, 2016’s sack leader, was off to a rough start to the season, earning an overall grade of just 52.3 through the first two games of 2017. He has produced just four total pressures on the quarterback on 34 pass-rush snaps for a pass-rush productivity of 10.3. 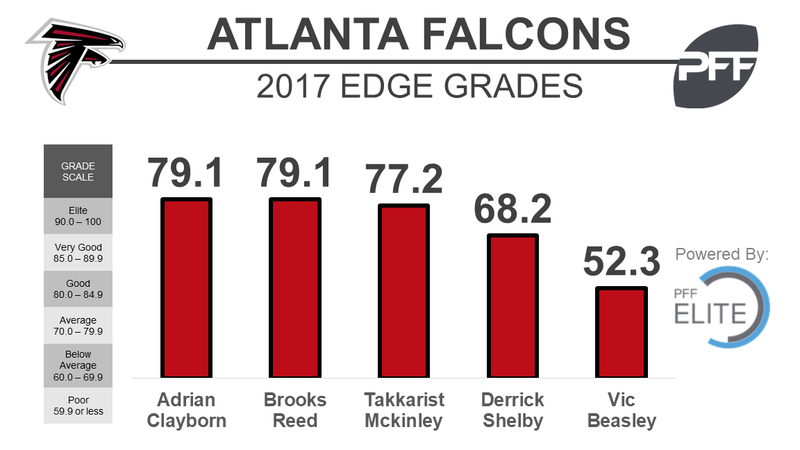 Upshaw, more of a rotational player, has been used mostly as a situational pass-rusher, playing both inside and on the edge. In 2016, he was an average pass-rusher, producing 18 total pressures on 208 pass-rush snaps while earning an overall grade of 69.1.